Mike Dunn recalls one of many stories involving Armando & himself for Chicago 5 Magazine’s ‘The Armando Project’ back in 2008. The pair were long time friends who created Muzique Records back in 1989. The label release quintessential EP’s such as Steve Poindexter’s ‘Work that Mutha Fucker’ & ‘Emergency’ & Terry Hunter’s ‘Madness’. 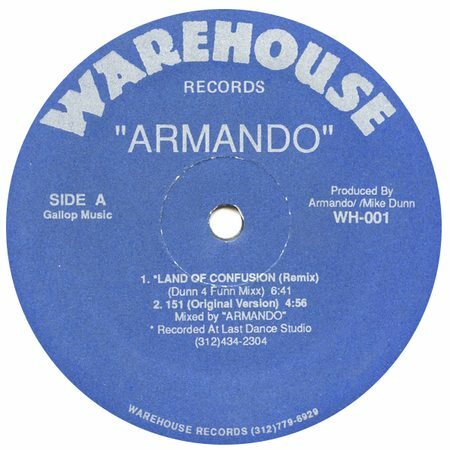 However it was Dunn who made the decision not to release Little Louis’ ‘French Kiss’ on their label; subsequently being released on Diamond Records, a sub label of Armando’s Warehouse Records. Formed from raw Casio drum machine patterns and early samplers, Poindexter certainly crafted a piece of dance music history. Aside from ‘Work That Mutha Fucker’, Mike Dunn lent a hand mixing this EP, including the incredible gurgling acid line in Born to Freak. Armando also spent time working as an A&R rep for Felix Da Housecat’s Radikal Fear label where he released one album & three EP’s. The pair worked on several of Armando’s tracks including Land of Confusion.